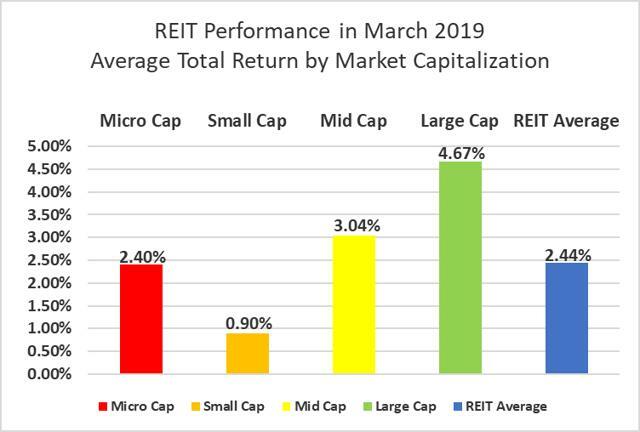 REITs continue to rise with a return of 2.44% in March and 17.35% in Q1 2019. 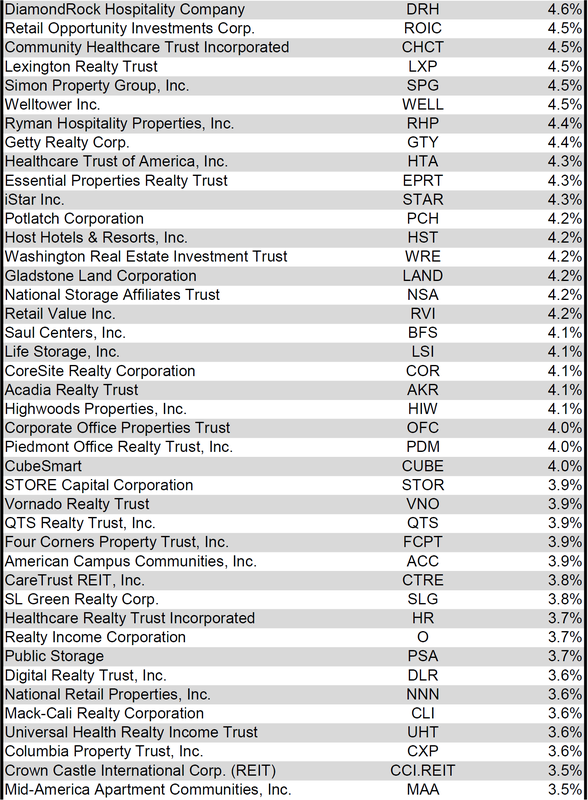 After a weak start to the year, large-cap REITs outperformed in March. 95.6% of REIT securities yielded positive returns in the first quarter of 2019. Land and Infrastructure were the top-performing REIT property types in March, while Corrections and Single Family Housing lagged behind peers. The REIT sector’s median discount to NAV narrowed from 7.6% to 6% during March. 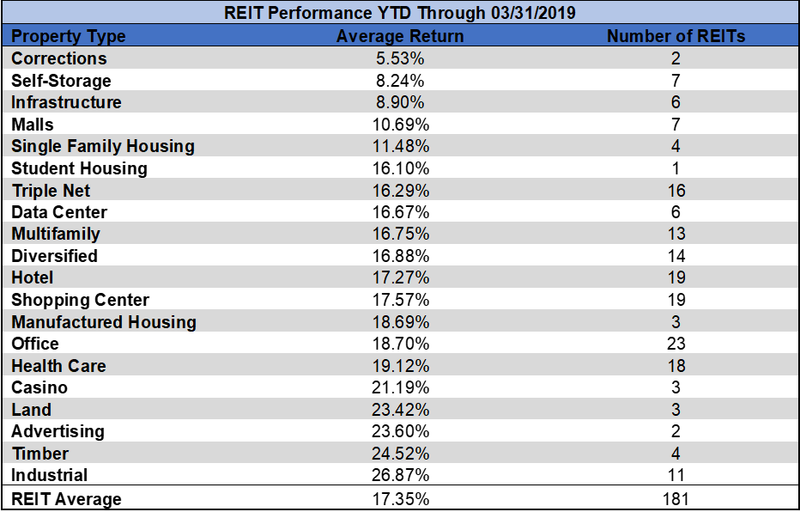 REITs have achieved gains in all three months of 2019, resulting in a remarkable 17.35% gain in Q1. REITs (+2.44%) fell slightly short of the NASDAQ (+2.61%) in March, but outpaced the S&P 500 (+1.79%) and Dow Jones Industrial Average (+0.05%). 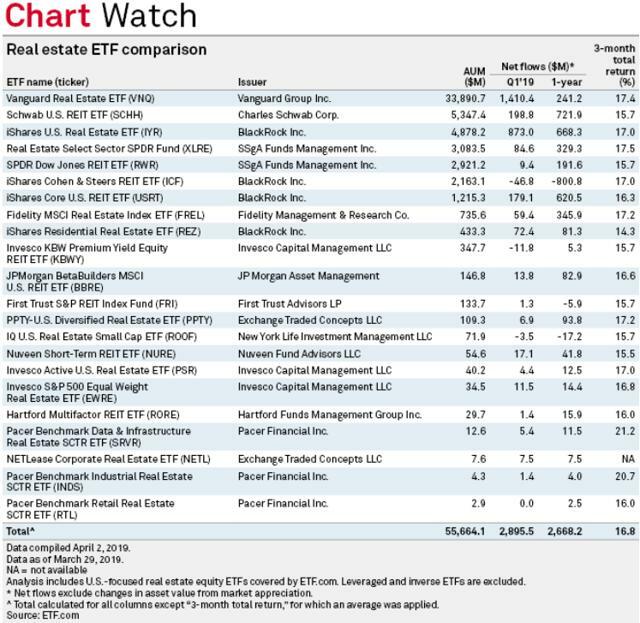 The market cap weighted Vanguard Real Estate ETF (VNQ) outperformed the REIT sector in March (+4.21% vs. +2.44%), pulling even with the REIT sector as a whole thus far in 2019 (+17.37% vs. +17.35%). 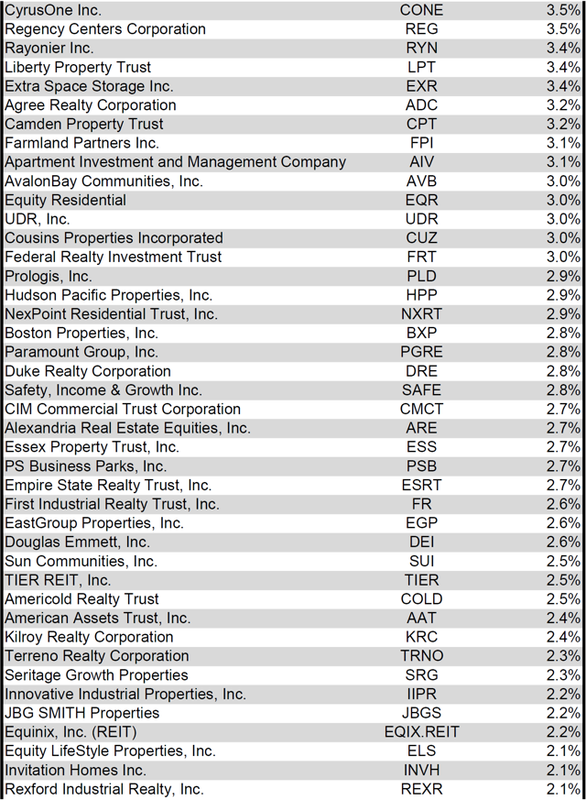 This ETF's performance is driven by the fact that large-cap REITs outperformed in March, but are in line with REIT sector performance in Q1. The spread between the FFO multiples of large-cap REITs (20.1x) and small-cap REITs (12.5x) continues to widen. Will the market continue to provide larger and larger premiums to big REITs or will this sizeable valuation gap narrow in upcoming months? In this monthly publication, I will provide REIT data on numerous metrics to help readers identify which property types and individual securities currently offer the best opportunities to achieve their investment goals. Large cap REITs achieved a return more than 5x that of small cap REITs in March. REITs of all sizes saw strong returns in the first quarter, but micro-cap REITs gained more than 850 bps more than their larger peers. 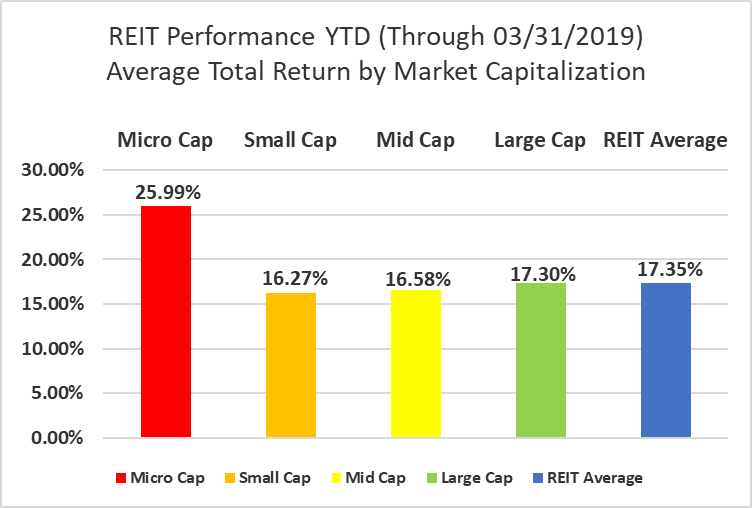 This outperformance of micro-cap REITs is primarily due to the fact that many of these micro-caps had been greatly oversold due to tax loss selling in November and December and prices have begun to move closer to fair value in early 2019. 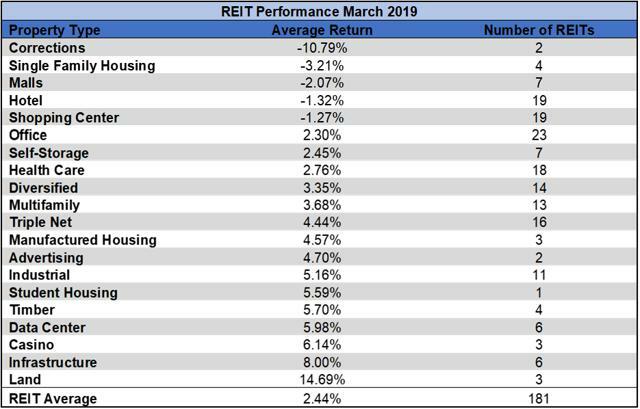 75% of REIT property types averaged a positive total return in March, with a massive 25.48% total return spread between the best- and worst-performing property types. Land (+14.69%) had the best average performance, boosted by the 25.49% return of Farmland Partners (FPI). 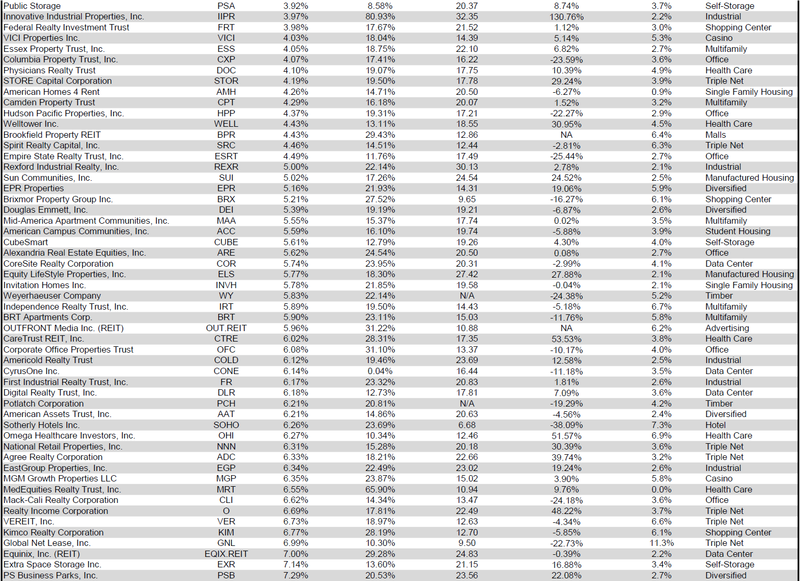 Corrections (-10.79%) had the weakest average performance, dragged down by the -15.49% return of GEO Group (GEO). 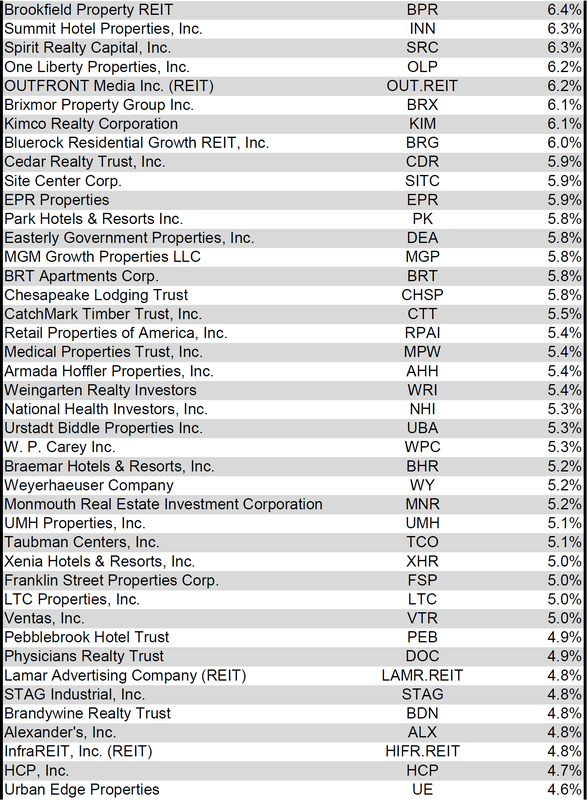 Although 25% of REIT property types averaged a negative return in March, all remain in positive territory YTD. Industrial REITs (+26.87%) were the best-performing property type in the first quarter, buoyed by a robust economy, the rapid growth of e-commerce and the renewed strength of American manufacturing. 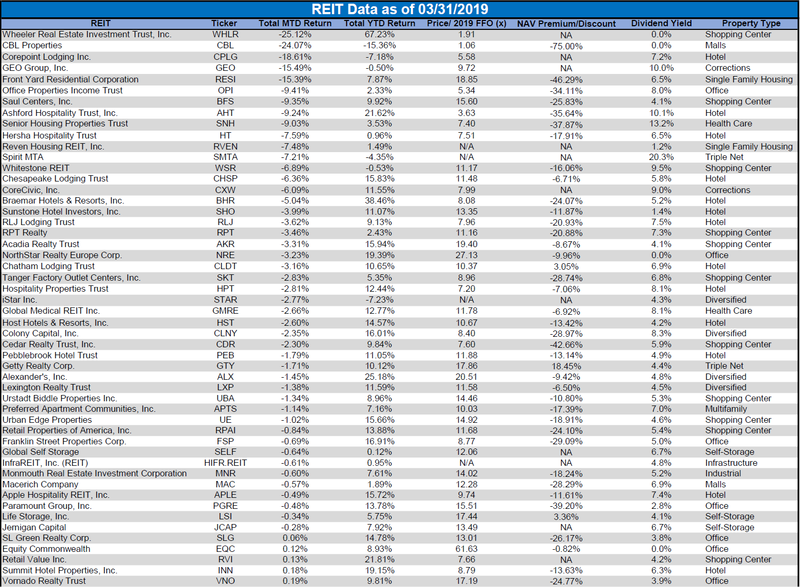 Corrections REITs (+5.53%) are significantly underperforming the REIT sector as a whole (+17.35%), due largely to increasing opposition from political activists that seek to eliminate the private prison industry. These activists have aggressively pressured banks and state and local governments to cut ties with both CoreCivic (CXW) and GEO Group (GEO). Numerous media outlets have joined in on the activism and run articles attacking the private prison industry as a whole as well as CXW and GEO specifically. The REIT sector as a whole saw the average P/FFO (2019) increase for the third straight month, rising from 13.1x (Dec) to 14.7x (Jan) to 15.1x (Feb) to 15.4x (Mar). The average FFO multiples rose for 75% of property types, fell for 20% and remained flat for 5%. Manufactured Housing (23x) saw further multiple expansion and continues to trade at the highest average multiple. Corrections (8.9x) saw substantial multiple contraction in March, overtaking Malls (9.3x) as the property type trading at the lowest average multiple. After soaring 123.32% in the first two months of 2019, Wheeler REIT (WHLR) dropped back sharply in March falling 25.12%. This decline was not the result of some substantial negative event, but merely part of a remarkably high level of volatility that has become par for the course for WHLR in recent years. This March decline dropped WHLR back to the second best-performing REIT thus far in 2019 (after being the worst-performing REIT in 2018). Innovative Industrial Properties (IIPR), an industrial REIT that leases space to marijuana companies at a high rent per square foot, is now the best-performing REIT of 2019 (after being the second best-performing REIT in 2018 as well) with a stellar 80.93% return. 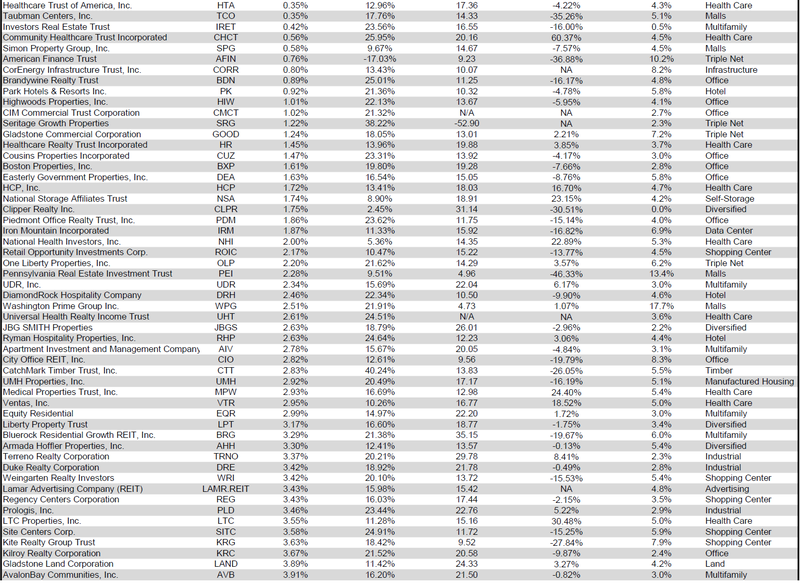 Farmland Partners (FPI) outperformed all other REITs in March with a strong 25.49% return. This big gain was largely fueled by the release of strong Q4 2018 earnings that included an impressive 37.5% year-over-year increase in AFFO/share. The share price of this farmland REIT had plummeted last year in the wake of a now infamous Seeking Alpha article that blasted FPI with a litany of unproven allegations. Although FPI has rebounded partially from the post-article lows, it still remains at a 44% discount to NAV. To take advantage of this tremendous discount, FPI has been aggressively buying back both common and preferred shares. 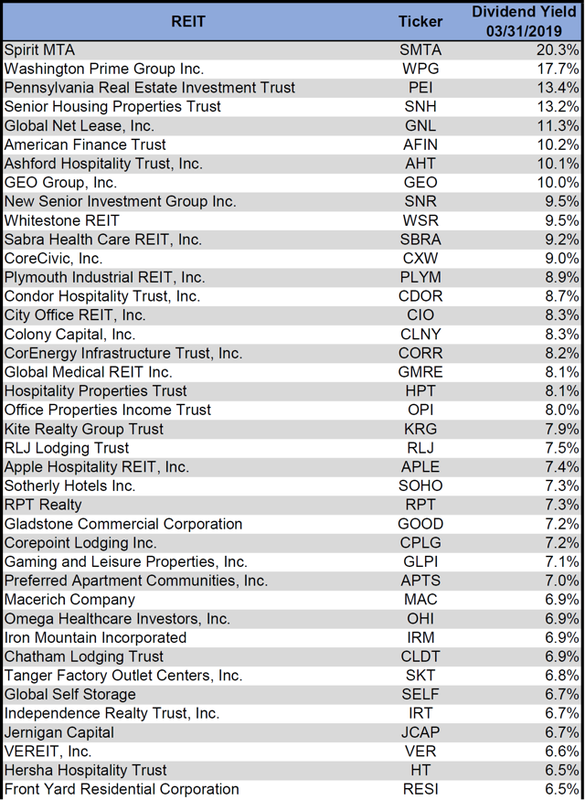 74.6% of REITs had a positive return in March, with 95.6% in the black year to date. 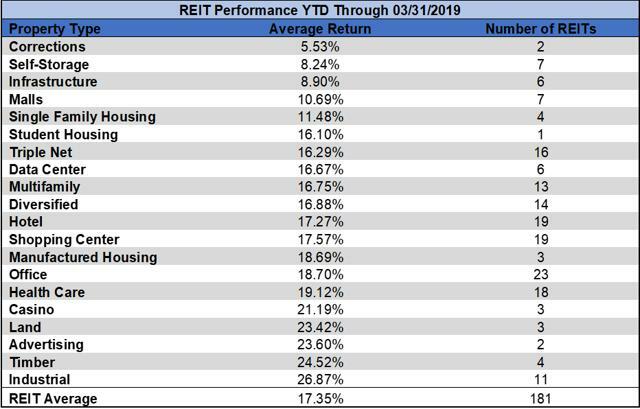 The first quarter of 2019 has been so much better for REITs than the first quarter of 2018. In the first quarter of 2018, the average REIT had a -9% return, whereas this year the average REIT is already up more than 17%. As I believe that better investing decisions can be made when more data is available, I have added an additional column this month to the table below. This table now includes the premium or discount to Net Asset Value (NAV) for every REIT for which a consensus NAV has been calculated. For the convenience of reading this table in a larger font, the table above is available as a PDF as well. Dividend yield is an important component of a REIT's total return. The particularly high dividend yields of the REIT sector are, for many investors, the primary reason for investment in this sector. As many REITs are currently trading at share prices well below their NAV, yields are currently quite high for many REITs within the sector. Although a particularly high yield for a REIT may sometimes reflect a disproportionately high risk, there exist opportunities in some cases to capitalize on dividend yields that are sufficiently attractive to justify the underlying risks of the investment. 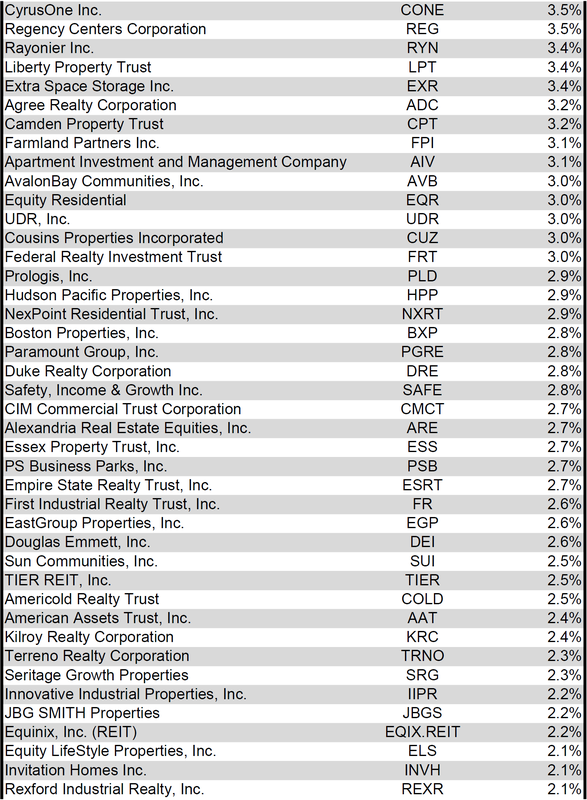 I have included below a table ranking equity REITs from highest dividend yield (as of 3/31/2019) to lowest dividend yield. Although a REIT's decision regarding whether to pay a quarterly dividend or a monthly dividend does not reflect on the quality of the company's fundamentals or operations, a monthly dividend allows for a smoother cash flow to the investor. Below is a list of equity REITs that pay monthly dividends ranked from highest yield to lowest yield. Although REITs are no longer available at fire sale pricing as they were at the beginning of the year, a meaningful discount remains. 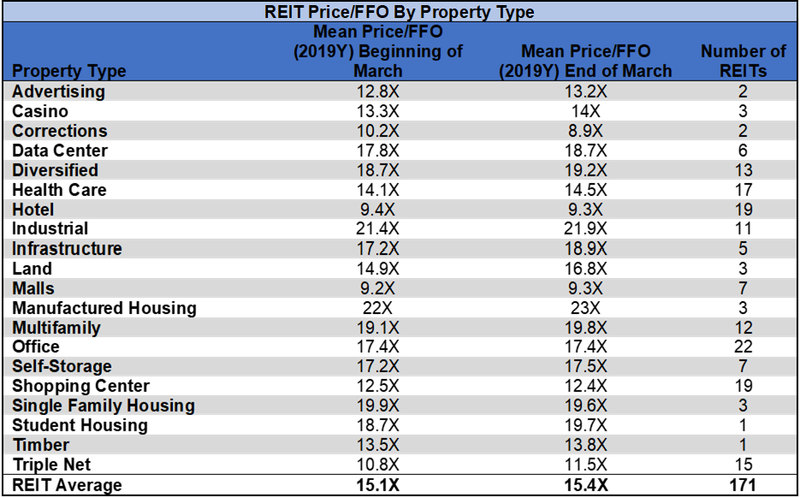 REITs began March at a median discount to consensus NAV of 7.6% and ended the month at a 6% discount. As Q1 earnings are reported throughout late April and May, some NAVs will be adjusted to reflect first-quarter performance and updated guidance. Prices may also see sharp movements based upon the strength of Q1 earnings and the context provided in each REIT's respective earnings call. Although it is likely that NAV adjustments and share prices for each REIT will move in the same direction, the magnitude will likely differ. 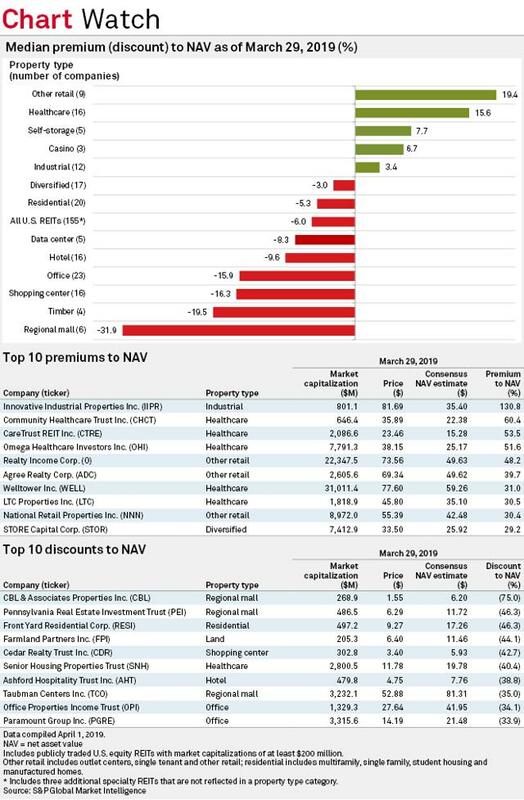 As a result, the current NAV discount could potentially narrow even if REIT prices decline or widen even if REIT share prices rise. Other Retail (This is retail that is neither regional malls nor shopping centers. For example: free-standing Triple Net Retail) overtook Healthcare as the REIT property type trading at the largest median premium to NAV. Other Retail soared from an 8.1% premium at the beginning of March to a 19.4% premium. Innovative Industrial Properties (IIPR), an industrial REIT that leases space to marijuana companies at a high rent per square foot, trades at the largest premium at 130.8% above consensus NAV. Mall REITs continue to trade at the largest discounts to consensus NAV with a median discount of 31.9%. The two most discounted REITs both own malls: CBL Properties (CBL) at a 75% discount and Pennsylvania REIT (PEI) at a 46.3% discount. The first quarter of 2019 saw massive investment inflows into REIT ETFs. 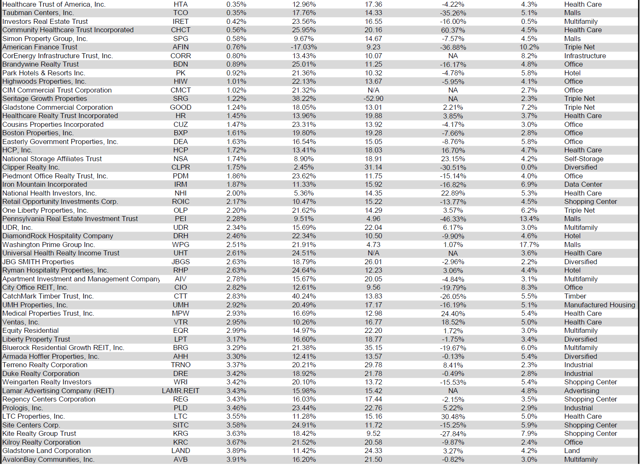 Although some people pulled their money out of these ETFs, far more money was put in. In total, REIT ETFs received $2.8955B of net inflows in Q1. 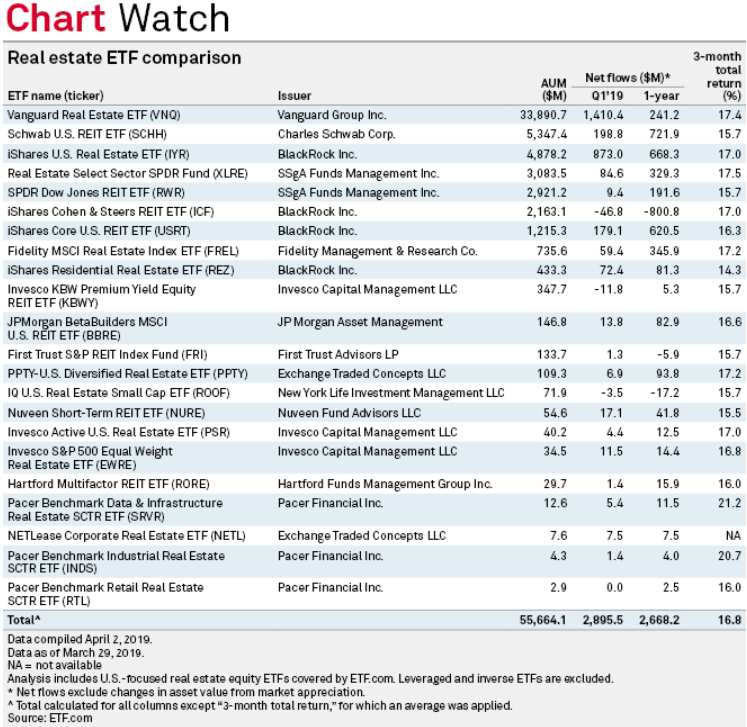 Nearly half of that money was put into the Vanguard Real Estate ETF and about 30% into the iShares U.S. Real Estate ETF (IYR). Together these two ETFs received about 80% of that nearly $3B net inflow in Q1. As both the VNQ and IYR are market cap weighted, a disproportionately large part of that capital was invested into large-cap REITs. This huge influx of investment into large-cap REITs pushed share prices up, but of course had no impact on the property level fundamentals of these companies. As a result, large-cap FFO multiples became further inflated and the already wide spread between the multiples of small-cap and large-cap REITs grew even more extreme. Although there are certainly valid arguments for why a valuation premium should be awarded to large companies (economies of scale, greater access to capital, etc. ), the current 7.6 turn premium (20.1x for large caps vs. 12.5x for small caps) is quite excessive. It is also worth noting that small-cap stocks have certain advantages as well. For example, micro-cap REIT Global Self Storage (SELF) achieved 11.7% same-store NOI growth in FY 2018 and an incredible 28.4% same-store NOI growth in Q4 2018. That kind of growth is attainable for a small REIT, but incredibly rare for a large one. The comparable same store NOI growth figures for large cap Public Storage (PSA) were 1% and 0.4% respectively. Small-cap REITs also have the advantage of being more likely acquisition targets (especially when they trade at substantially lower multiples). Investors are currently paying on average about 60% more for each dollar of FFO/share to buy large-cap REITs than small-cap REITs (20.1x/12.5x - 1 = 60.8%). Whether large-cap REITs are currently overpriced or small-cap REITs are currently underpriced, that tremendous gap will eventually narrow. Active investors who are long securities with unwarranted discounts and/or short overly inflated ones have the potential to greatly benefit when that narrowing occurs. By carefully analyzing REIT data and industry trends, active investors have the opportunity to outperform ETFs. Disclosure: I am/we are long GEO, CXW, CBL, PEI & SELF. I wrote this article myself, and it expresses my own opinions. I am not receiving compensation for it (other than from Seeking Alpha). I have no business relationship with any company whose stock is mentioned in this article. Additional disclosure: 2nd Market Capital and its affiliated accounts are long GEO, CXW, CBL, PEI & SELF. I am personally long SELF. This article is provided for informational purposes only. It is not a recommendation to buy or sell any security and is strictly the opinion of the writer. Information contained in this article is impersonal and not tailored to the investment needs of any particular person. It does not constitute a recommendation that any particular security or strategy is suitable for a specific person. Investing in publicly held securities is speculative and involves risk, including the possible loss of principal. The reader must determine whether any investment is suitable and accepts responsibility for their investment decisions. Simon Bowler is an investment advisor representative of 2MCAC, a Wisconsin registered investment advisor. Positive comments made by others should not be construed as an endorsement of the writer's abilities as an investment advisor representative. Commentary may contain forward looking statements which are by definition uncertain. Actual results may differ materially from our forecasts or estimations, and 2MCAC and its affiliates cannot be held liable for the use of and reliance upon the opinions, estimates, forecasts and findings in this article. Although the statements of fact and data in this report have been obtained from sources believed to be reliable, 2MCAC does not guarantee their accuracy and assumes no liability or responsibility for any omissions/errors.